What color is the night sky? Contrary to prevailing views, the moonless night sky is rarely, if ever, black or blue. It is actually much more colorful. In this article, I'll describe some of the colors and the physical reasons for those colors. Film Era: Blue Night Skies? The daytime Earth's sky is blue due to Rayleigh scattering. Rayleigh scattering increases in efficiency as the wavelength of light becomes shorter (blue light has a shorter wavelength than green, yellow, or red light). Rayleigh scattering results when light encounters a particle much smaller than the wavelength of light. In our atmosphere, those particles are the molecules that make up our atmosphere, including nitrogen and oxygen. So if the daytime sky is blue due to scattered light, the moonless night sky should have a component of scattered starlight. It does, but just as the sun is many times brighter than the blue sky, scattered starlight is many times fainter than starlight. And stars are already pretty faint. But other processes occur in both the daytime and night sky, including aurora and airglow. Aurora and airglow occur during the day but are usually so much weaker than the blue Rayleigh scattered light from the sun that we do not notice it. But at night, the light from airglow, and if at higher north or south latitudes, aurora, are usually brighter than the blue Rayleigh scattered light from stars. Airglow is caused by luminescence of molecules in the upper atmosphere. The luminescence is the result of excitation of atoms by cosmic rays and ultraviolet light from the sun. Both of these processes are global in extent, and cosmic rays strike the Earth both day and night. Thus, airglow can be strong at any latitude, including equatorial regions. For example, I have observed strong red airglow in equatorial east Africa on moonless nights and far from any city lights. Aurora are caused by charged particles from the sun, mainly electrons and protons, colliding with atoms in the upper atmosphere. The collisions excite the atoms and they release the energy as light, at the same wavelengths as the airglow. Aurora generally occur toward the poles as the magnetic field of the Earth deflects many of the incoming charged particles and the magnetic field traps the particles and funnels them into the polar atmosphere where they collide with the atoms in the upper atmosphere. If the moon is up and more than a thin crescent, the light from the moon is much brighter than stars and airglow, so Rayleigh scattered light from the moon will color the night sky blue, but that will also result in too much light to see fainter stars. Aerosols reflecting light from stars and the Milky Way (more neutral in color, e.g. hazy). Airglow, emission line light emitted by atoms in the upper atmosphere. Emission line light is narrow band, like neon signs, so very colorful and very saturated, usually greens and reds but can be orange, yellow, pink and blue. These are the same colors as polar aurora, but show all over the world. Red (emission from oxygen above 100 km) is more common at lower latitudes. See Part 4c for more info. Scattered light in the solar system (e.g. Zodiacal light), generally blue-gray. Planets, e.g. red Mars, Yellow Jupiter, Saturn, yellow-white Venus, reddish Mercury. Stars: multiple colors (except green). Most stars are red, orange, yellow, and white. Less than 1% of stars are blue. Part 2b give more details. Emission nebulae are again like neon signs so very saturated colors, including blue, magenta, intense pink, and green. Some reflection nebulae are deep blue like our daytime sky from a high mountain altitude (and the same process--Rayleigh scattering from tiny articles). Parts 2c, 2f give more details. Interstellar dust: burnt orange, like reddish rust, or very red dirt. Some interstellar dust includes oxygen, hydrogen and other atoms with narrow emission lines adding other (saturated colors) to the interstellar dust color. Part 2c gives more details. The true colors of the night sky are actually quite saturated, just hidden by the effects in our atmosphere. If you want to show the colors of the night sky beyond the earth, you need to SUBTRACT the scattered light from the earth's atmosphere, including light pollution and airglow. Parts 2d, 2e, 3a, 3b, 3c give examples of processing. Photography can be about showing what we see with our eyes, and also what exists but we can't see. For example, high speed photography can show processes too fast for us to perceive. Long exposure photography blurs action, for example making a waterfall appear smooth. Or long exposure photography to show us things too faint for us to see, e.g. the beautiful nebulae and galaxies in the night sky. Photography can also show us light we can't see, for example, ultraviolet of infrared photography, or narrow band photography. All are legitimate forms of photography. Here I discuss the true natural colors in the night sky. We know the true colors by the spectra of the objects in the night sky and the known spectral response of the human eye. Indeed, with different telescopes and sky conditions, many of the these colors can be directly verified visually. Many objects in the night sky can show color, including hydrogen emission nebulae, planetary nebulae and stars. The main inhibitor to detecting color visually is low contrast due to airglow and light pollution, and lack of good dark adaptation (see Part 6 for lighting and dark adaptation). Airglow is more intense around solar maximum (e.g. 2013-2014) and appears brighter near the horizon because we are looking through more atmosphere. This near-horizon effect is apparent in Figure 1. Figure 1. 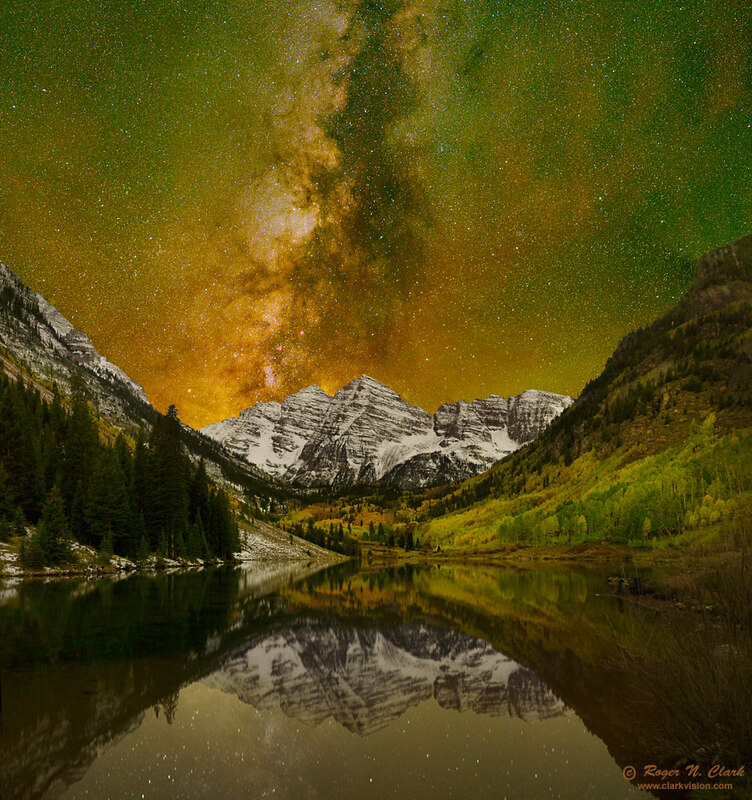 Maroon Bells Nightscape. This scene is all natural light and natural color. The light on the land is that from the night sky: light from stars, the Milky Way galaxy, and airglow: light from molecules in Earth's upper atmosphere excited by solar ultraviolet light during the day and from cosmic rays. The molecules emit light throughout the night. The green is from oxygen typically 90-100 km high. The red is typically from hydroxyl (OH) 80 to 90 km high. The airglow light is emission line sources, like that from a neon sign. That narrow-band light creates enhanced colors on the landscape, in particular greens and reds in the trees. Full image description and larger image at: Maroon Bells Nightscape Vertical Panorama. Image Color Balance. The image above (Figure 1) has gotten a lot of comments, some quite off the mark. For example, "consider changing the tint to more accurately depict what was seen that night (more black/blue than green)." The Earth's moonless night sky is rarely black or blue, especially at solar maximum when this image was obtained in September, 2013. 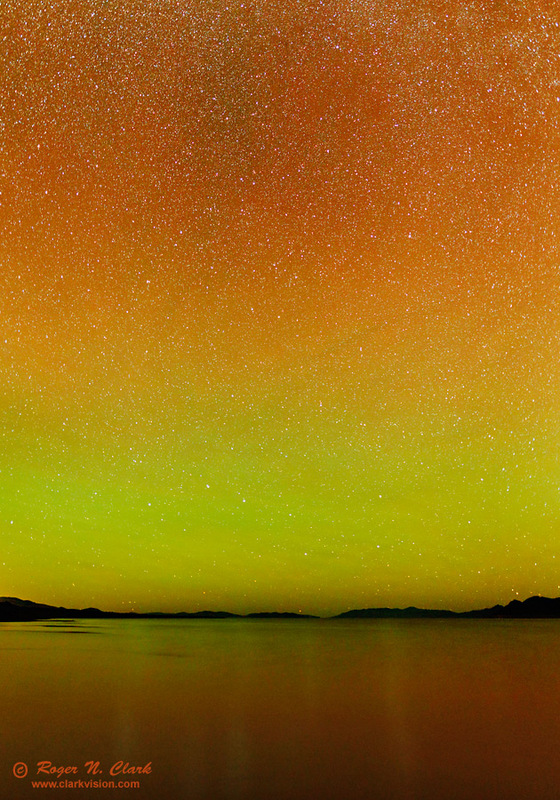 With the red and green airglow emission, as noted in the Figure caption, the dominant light on the landscape from the night sky was yellowish green when this image was obtained. The lake reflection loses some of the yellow and enhances blue due to the index of refraction of water being higher in the blue than in the red, so the color of the reflection will always be different. Also, note the reflection toward the bottom of the image is more brown. That is particularly evident on the left side in the reflection of the pine trees. The brown color is due to light reflected off the bottom of the lake, from the brown mud, and that reflection reduces contrast in the reflected light of the land and sky. In the sky, the Milky way is low in the sky so is reddened much like the sun appears more red when low in the sky. I process my images on a color calibrated monitor using color calibrated workflow. The colors shown represent the correct color tint. Of course I adjust contrast and saturation to make a beautiful image, but if this image could be made on fine grained color slide film, the colors would be similar but more intense and with higher contrast. The image was made with a "sunny" daylight color balance on the camera. More on color balance below. There are other lines, like some weak blue molecular oxygen emission lines, O2, at the same altitude as atomic oxygen 558 nm emission, but are too weak to affect color compared to the 558 nm green oxygen emission. Aurora show similar colors as airglow, because the same atoms can be excited. Aurora can often be many times more intense than airglow and readily show color to our unaided ayes. Figure 2 shows a strong aurora near Latitude 40 degrees north during the solar maximum in 2003. 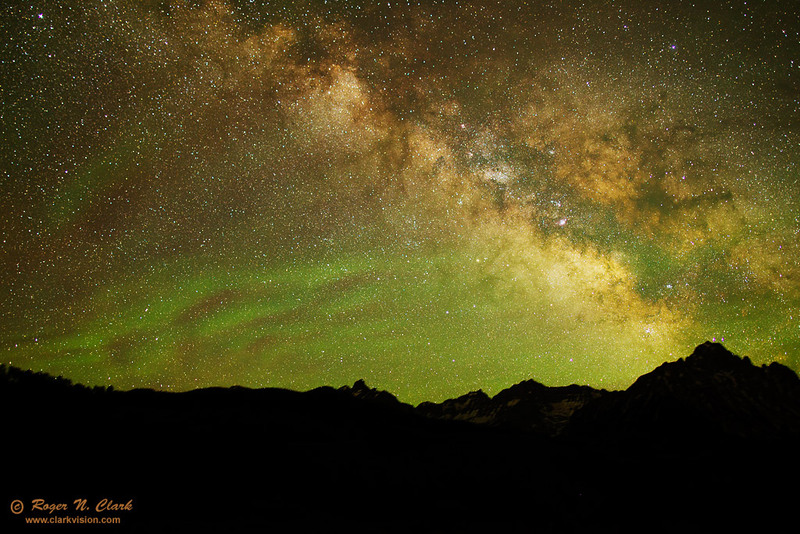 Note the green color is similar to that in the Maroon bells image with airglow in Figure 1. The red in the aurora is much stronger than the airglow in Figure 1, but the light is being emitted at the same wavelengths. The colors were so bright, they were evident to my eye. See Aurora Photography for more details. Figure 2. Strong auroral ray imaged from the Denver metro area during a strong geomagnetic storm. There are many processes that give the night sky beyond our atmosphere beautiful color, including the Zodiacal light, the color of stars, nebulae, both emission (e.g. red and green emission) and reflection (usually blue) and combinations of these colors. We see bluish-gray light from sunlight scattered by dust in our Solar System, called the Zodiacal light. The dust occurs manly in the plane in which the planets rotate around the sun, called the ecliptic, where the Zodiac is located. The dust is relatively large grains, but has some fine components. The scattering efficiencies are slightly higher in the blue for these grain sizes, but not nearly as much a finer particles with Rayleigh scatter. Thus, the Zodiacal light is bluish gray, as shown in Figure 3. Figure 3. 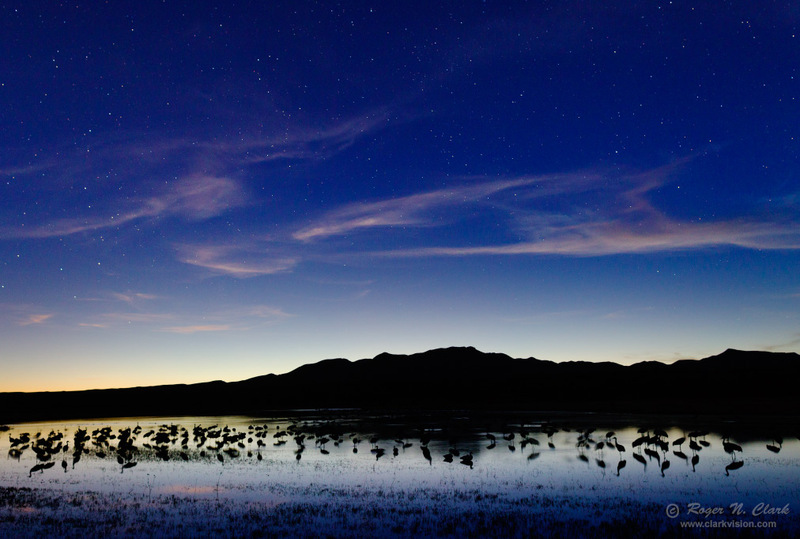 Night at Bosque del Apache, New Mexico in natural color. The bluish-gray band extending to the upper left corner is the Zodiacal light. The Milky Way extends toward the upper right. Near the horizon is red airglow also illustrating that airglow is usually more intense near the horizon. Figure 4. Green and red airglow over Pyramid Lake, Nevada, natural color. The view is looking north toward the Black Rock Desert. The Big Dipper is just above the horizon in the green zone. Green and red emission mix to give yellows and orange colors. Sodium emission may also contribute to the orange color. Images with a 24mm f/1.4 lens at f/2, 30 second exposures at ISO 1600. This is a 3-frame mosaic. The night sky beyond our Solar System is filled with many colors. Stars range from solar type (like our sun) to cooler orange and red stars, to hotter than our sun, with blue-white colors. There are no green stars. In the plane of the Milky Way galaxy is a lot of dust and gas. Dust in our atmosphere makes the setting sun red. This is transmitted light. Dust in the Milky Way is similarly red: a brownish red. If light is reflected, and the particles are very small, the dust appears blue, like smoke particles reflecting light in our atmosphere, or the daytime sky. The blue is from a process called Rayleigh scattering that scatters blue light more efficiently than red light. Gas in the galaxy is mainly composed of hydrogen, which emits light like a neon sign or fluorescent light when the atoms are excited by the radiation in space, but at the wavelengths of hydrogen are in the red (Hydrogen-alpha at 656.28 nm) with a weaker line in the blue green (hydrogen beta at 486.1 nm). Oxygen is also a common component and it emits greenish-blue light. (The green emission in nebulae is from doubly-ionized oxygen, called O III, at 500.7 nm, and is a bluer green than the chartreuse green airglow like in our atmosphere which is from singly-ionized oxygen.) Thus, nebula (clouds of gas) can appear pinkish, magenta, green or blue. Examples are shown in Figures 5, 6, and 7. Many astrophotographers use modified cameras to let in more of the red light from hydrogen, making nebulae appear very red and are not true color images. But a true color image, that is images made with the spectral response close to that of the human eye, show a more pinkish color to nebulae. Unmodified digital cameras are very good true color cameras. True color should not be confused with color balance. An image from true color camera can still be pushed to have unnatural colors due to the relative color balance between red, green and blue channels. Figure 5. 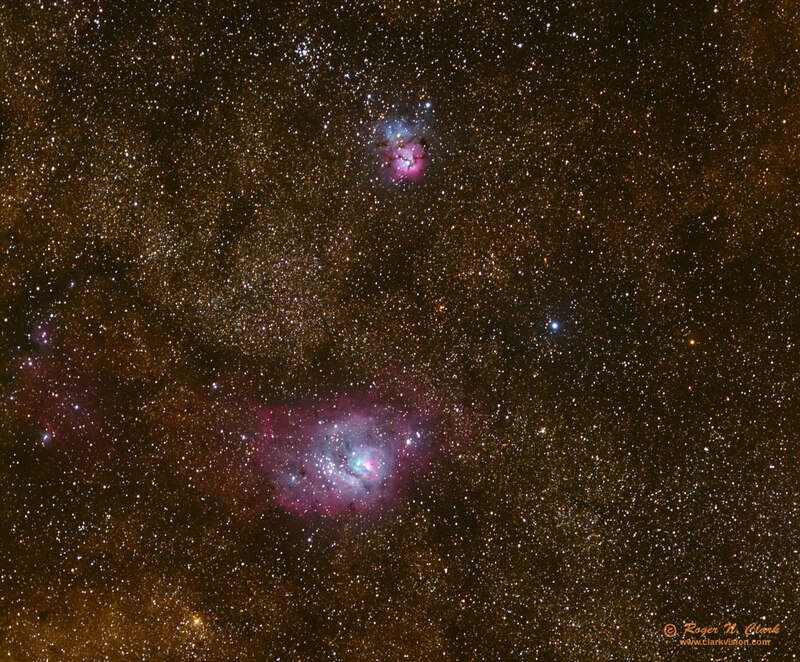 M8, the Lagoon Nebula and M20, the Trifid Nebula in Sagittarius near the center of the Milky Way galaxy. The effects of airglow from the Earth's atmosphere have been removed from this image. The colors include: brownish-red from dust in the Milky Way galaxy, which is particularly abundant around the galactic center, and the constellation Sagittarius and nearby constellations. The red nebula shows the glow from hydrogen gas, and the blue is light scattered off of fine dust particles, where the blue is created by Rayleigh scattering, the same process that makes our daytime sky blue. Figure 6. The constellation Orion. Orion is nearly opposite the center of the Milky Way, so we are looking at an arm of our galaxy that contains much less dust. The plane of the Milky Way is just off the left edge of this image. The image contains faint reddish brown signatures of dust, along with pink emission nebulae containing hydrogen and bluish nebulae from Rayleigh scattered starlight. Figure 7. 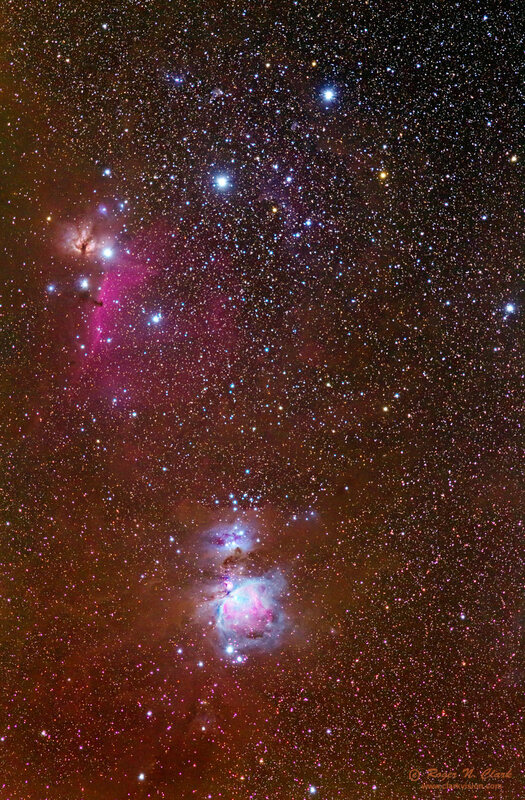 The Sword and Belt of Orion shows more detail than in Figure 6. 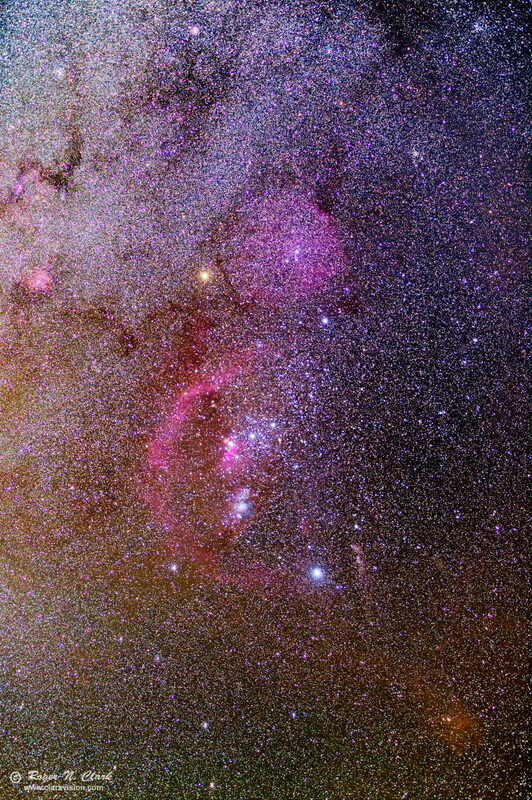 The image contains faint reddish brown signatures of dust, along with pink emission nebulae containing hydrogen and bluish nebulae from Rayleigh scattered starlight. Note the many blue stars in the image. Galaxies have more redder stars near their centers and bluer stars in the outer spiral arms. Compare the numbers of blue stars here to those in Figure 5. If been asked to look at the film area when film recorded skies as blue. I've been imaging the night sky since junior high school, long before the digital camera era. I have thousands of color night sky images. The color of the sky in my images is all over the place: magenta, green, yellow, red, blue, and black. The problem with long exposures on film is reciprocity failure, and the different colors in color film have different failure rates. Thus the colors drift depending on the film and how it is handled. Colors were simply not reliable at the long exposure times required. Figure 8 shows a nice star trail image with a blue sky. But I started the exposure in deep twilight, so it naturally recorded some blue. Is the green real or from reciprocity failure? No, film did not reliably record accurate colors in long exposure night photography, unless one accurately calibrated the reciprocity failure of the different colors and used the appropriate color correction filters. Figure 8. 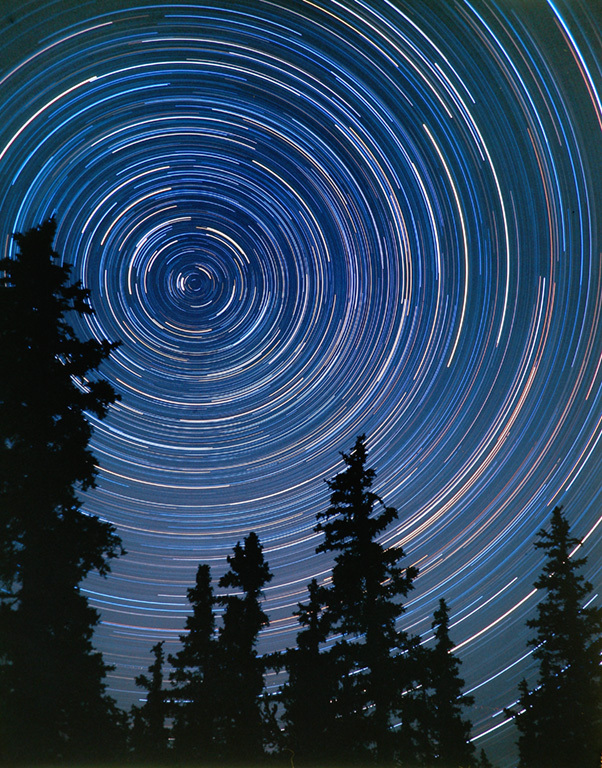 A star trail image made with film on 4x5 sheet film. This image was made near solar minimum when airglow was very low. The sky shows as blue and green. The blue is from starting the exposure in deep twilight. The green may be due to airglow or reciprocity failure. I acknowledge that the prevailing view by today's digital camera night sky landscape photographers is to make the sky dark blue or black. Some advocate setting color balance to fluorescent or tungsten in order to make the sky blue or black, or stretch their images to make their images look blue or black. Often this results in strange colors, like purple, for the Milky Way. Figure 9. An example nightscape image in natural color. 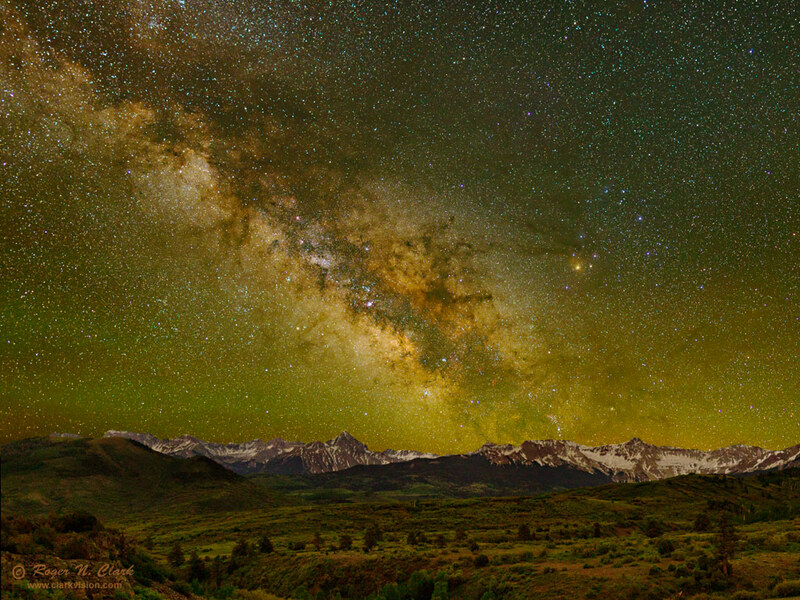 The Milky Way rises over the San Juan Mountains of Colorado in June. Key elements to this image include good star colors, the background sky shows color from airglow, and the landscape is not just a silhouette, but is beautifully lit by the natural light from the night sky (stars, the galaxy, and airglow), and the colors in the image are natural (too many nightscapes are artificially turned blue in post processing). See the Gallery Image for more information about this image. Many night sky digital photographers have the idea that the night sky is blue and torque the color balance to make everything in the night sky a beautiful deep blue. One way they do this is to use a fluorescent light color balance. Figure 10a gives one such example processed with a fluorescent color balance. Figure 10b shows the more natural color balance. The star clouds of the Milky Way are reddish-brown. Stars have more subtle colors, ranging from red to orange to white, and bluish-white. The color of the sky is green from oxygen emission (the green bands are called banded airglow), and red from oxygen and hydroxyl. Figure 10a. Night sky digital photo of the summer Milky Way using fluorescent color balance. These colors are not the natural colors. Figure 10b. Night sky digital photo of the summer Milky Way using daylight color balance. These colors show the natural colors we would perceive if our color vision were sensitive enough. The daytime clear sky is blue because of Rayleigh scattering. Rayleigh scattering has greater efficiency toward blue wavelengths and is caused by particles much smaller than the wavelength of light. The daytime sky can also appear white and this is due to Mie scattering: the scattering by particles similar to and larger than the wavelengths of light. Typically white is caused by aerosol scattering. But as the sun sets, and the as the sky becomes dimmer with approaching night, the sky becomes bluer. This is because the Earth (including mountains and clouds) block sunlight on the lower atmosphere, but the sun still illuminates the upper atmosphere. The large scattering particles (aerosols) responsible for the white or washed out blue are no longer illuminated by sunlight because they are concentrated in the lower atmosphere (haze), leaving only air molecules high in the atmosphere, predominantly nitrogen and oxygen, illuminated by the sun, to scatter light so we see the full effect of the blue color of Rayleigh scattering. Figure 11a shows the sky well after sunset but where high clouds are still faintly illuminated by the brighter atmosphere near the sun. This blue twilight time is called the blueing hour. Figure 11a. Twilight on the night the image in Figure 3 was obtained. Natural color. The twilight sky becomes very blue. Compare the color in Figure 3 with that in Figure 11a. On this night, there is no detectable green airglow from oxygen at the 558 nm emission line. The night sky is dominated by red in Figure 3, an indication of emission dominated by hydroxyl. Airglow also occurs during the day, and in fact is much stronger than it is at night. We do not see it because the scattered sunlight is so much brighter. But on nights when the green airglow from oxygen is active, we can usually see it in deep twilight as a green band near the horizon (Figure 11b). On the night in Figure 11b the green airglow was strong. You can predict how the beginning of a night my be concerning the intensity of the green airglow by watching for this green color band in twilight. Conditions can change in less than an hour, so observing the green band is only an indicator. Figure 11b. The green band in deep twilight is airglow from oxygen emission. Natural color. The color is usually visually quite apparent in twilight on nights when the airglow emission is strong. As twilight fades, the Rayleigh scattered light from the sun fades to a level below airglow. Twilight has a similar intensity to the airglow in the image in Figure 11c. As twilight fades further, all traces of blue from Rayleigh scattering fade unless the Moon is out and more than a thin crescent. Figure 11c. Image about 1.2 to 1.5 hours after sunset, when the blue from twilight (right side of the image) is similar in intensity to the red and green airglow (left side of the image). Natural color. The bright object in the twilight is the crescent moon. See the gallery image for more details. Certainly all light entering the Earth's atmosphere will have some light scattered by the Rayleigh effect. So why not stars? Yes, starlight is Rayleigh scattered. But it is also Mie scattered. The sky around the sun is not blue because Mie scattering dominates over the Rayleigh scattered component. Similarly with the Moon. Close to the moon, the scattered light is not blue because Mie scattering dominates. This is easily observed in Figure 11c, where the light around the Moon (the bright object near the left edge) is surrounded by a yellow halo. Stars do the same thing: bright halo of Mie scattered starlight and fainter Rayleigh scattered component. Because stars cover the sky, the Mie scattered component dominates, so scattered starlight that brightens the night sky has color closer to the star colors, and most stars are similar to the color of our sun (yellow) or redder, with fewer blue-white stars. There are extremely few blue stars, though some of the bluish stars are bright blue giants. The bottom line is that scattered starlight is not dominantly blue from Rayleigh scattering, to the contrary it is closer to neutral relative to the star, from Mie scattering, and because there are more cooler yellow and red stars, scattered starlight on average will be yellowish rather than bluish. We can get a good estimate of the Rayleigh scattered starlight by measuring the intensity of the clear blue daytime sky. The Sun is visual magnitude of -26.7. Most people know that the Sun is too bright to look at, but the blue sky is not. Measurements of the blue sky indicate a surface brightness of about magnitude 4 per square arc-second. A good dark sky location has a visual magnitude of about 22 per square arc-second, or about 18 magnitudes fainter. One magnitude is the fifth root of 100, 2.51189, so 18 magnitudes is 2.5118918 = 15.8 million. Thus, a dark night sky is about 15.8 million times fainter than the daytime clear blue sky. The clear blue sky per square arc-second is 4 - (-26.7) = 30.7 magnitudes fainter than the sun. That is 1.9 trillion (1.9x1012) times fainter! This means that a bright magnitude zero star will show Rayleigh scattering across the sky with a surface brightness of 30.7 magnitudes per square arc-second, or about 8.7 magnitudes (3000) times fainter than a very dark night sky. There are more fainter stars, which we can sum upm the contributions. for example, there are about 140,000 magnitude 9 stars (magnitude 8.5 to 9.5) and the Rayleigh Scattering from each would be magnitude 30.7 + 9 = 39.7 per square arc-second. The 140,000 stars brightens the Rayleigh scattering by 12.9 magnitudes, for a total of 39.7-12.9 = 26.8 magnitudes per square arc-second, or 4.8 magnitudes fainter than a dark country sky, thus Rayleigh scattering of magnitude 9 stars is about 1% of the dark sky signal. We can do this calculation for all stars and the total only comes to a small fraction of the darkest night sky brightness. Plus fainter stars tend to be cooler red stars, or stars at greater distances and reddened by interstellar dust, so there is little blue light. That means what scattering there is in our atmosphere from faint stars is much redder than what we see from daytime scattered sunlight. All of the above may be fine from a technical description of color, but the light at night is faint and many photographers say we do not see any color. Because of this misperception, some photographers say there is no color so we can color our night images any way we want. Another online photographer said "The beauty about night photography is there really is no basis for comparison to reality, because the eye cannot see what the camera does..."
Photographers can certainly color their images any way they please, including blue clouds at sunset, green snow, or whatever they want to create a mood or effect. 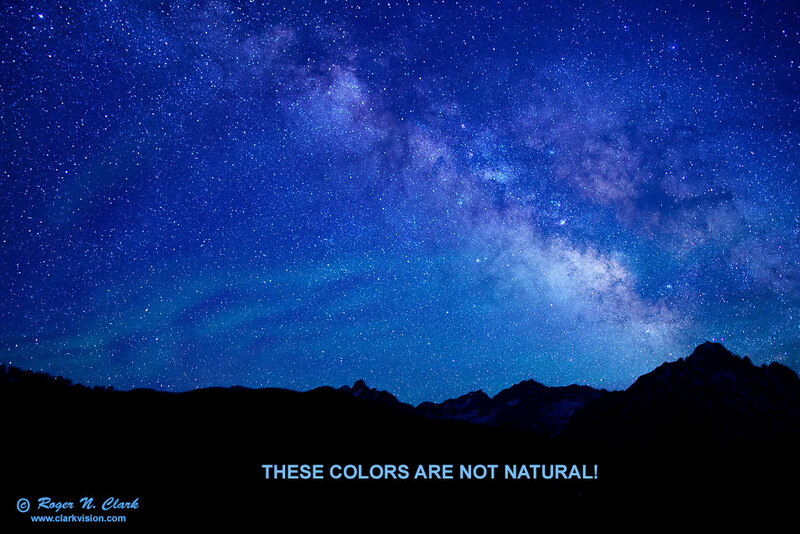 But some are claiming blue is the correct and natural color of the night. However, there are plenty of colors that can be seen in the night sky, even with the unaided eye to tell us what the color balance should be. We can actually see some colors at night. For example, bright stars show colors visible with our unaided eye(s). Antares (the bright star near the right edge in the image), shown in Figure 12 is distinctly orange to the (normal) eye. Altair (upper left corner) is white/bluish-white. If really well dark adapted (no bright red lights) the star clouds of the Milky Way around Sagittarius show as a faint yellow-brownish color. If you use a good telescope, some of the red emission nebulae do appear as a pastel pink (M8, M20 in the image), and blue reflection nebulae do appear light blue (M20 northern component, the Merope nebula in the Pleiades, M45). M8 and M20 are seen in Figure 12 near the center, and a close-up is shown in Figure 5. 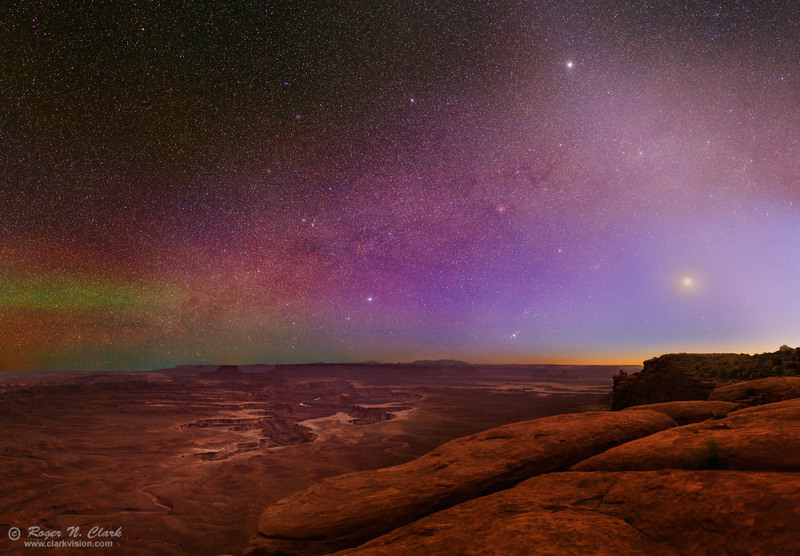 The airglow also shows color when it gets bright enough. On the night of the image in Figure 12, the green band on the horizon did have a distinctly greenish-gray color compared to the sky above (the red was too faint to distinguish red color and appeared gray to em). As the airglow brightens, the color comes out, and I have seen pinks, greens and reds many times over the last year or so from Colorado. 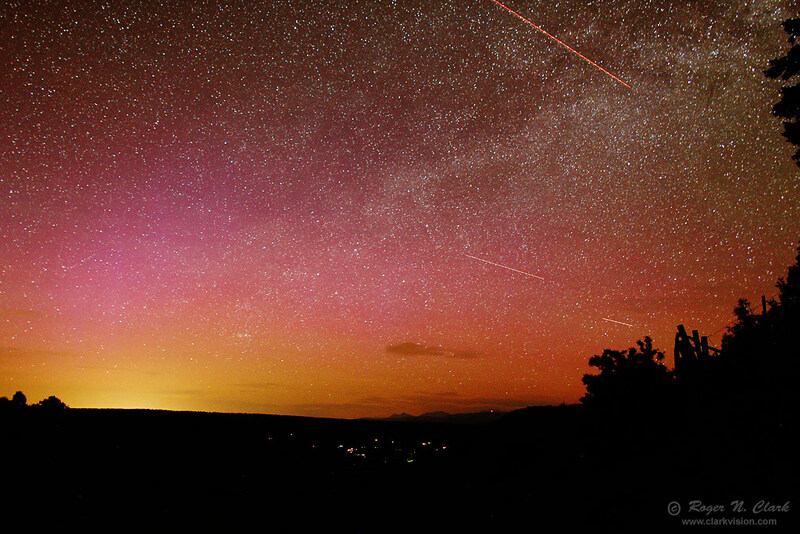 The scene in Figure 9, which was made of the same mountain range as that in Figure 12, only a few miles away, was made on a night of strong green airglow to the south, but strong pink aurora to the north. Before I made a quick exposure of the northern sky, I could tell it was a pinkish-red aurora, and the camera confirmed it Figure 13). The digital camera is bringing those colors out much better of course, but we can typically verify that the hues are correct based on those colors we can detect, especially the colors of stars. Repeated experience shows that a daylight white balance is the correct white balance to show the true colors of the night sky. I see many night sky photos from other photographers where they used a tungsten, fluorescent, or similar, white balance to make the night sky and stars blue. Antares does not appear blue to our eyes, and neither does the sky between stars. Verify the above yourself. Next time you are out under a clear dark, moonless night sky away from city lights, spend at least a half hour viewing the sky with no lights of any kind turned on. Your eyes will become very dark adapted and your be able to see colors of many stars. 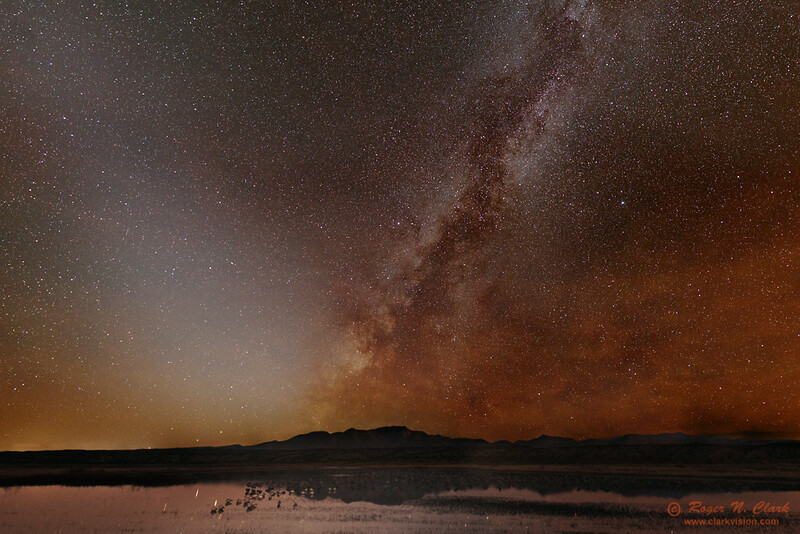 Some parts of the center of the Milky Way, if it is high in the sky, will show as brown. If you are lucky, airglow or aurora will show color. Try viewing the Milky Way region with a good pair of binoculars, like 7x50 or 10x80. You'll see more stars with color, and if you come across the brighter nebulae, like M8, or if Orion is up (in winter in the northern hemisphere), the Great Nebula in Orion, M42 in Orion's belt will likely show some color. A good telescope will show even more colors. If you have a MacBeth color chart, take it with you when you go out observing or photographing the night sky. Hold it out after you are dark adapted so that it is illuminated by the night sky. What colors can you see in the chart? With the reference colors of the chart, you can also compare to the Milky Way and stars. With binoculars or a telescope, you can defocus the stars and see colors better. Or if you wear glasses, take them off and brighter stars will show their colors better. One of the issues with color perception is the night sky is dominantly one color, yellowish, so without color contrasts, it is harder to perceive color. The MacBeth (or other) color chart helps give a reference. I challenge the photographers who claim the moonless night sky away from cities sky is blue to actually try the above with no lights viewing the night sky for at least a half hour. Do you really see Antares, Arcturus, Betelgeuse, Mars, Saturn, and Jupiter as blue? Can you really see no other colors except blue? Learn to SEE! For more on color perception at night, see Part 6b of this series: Color Vision at Night. One key factor in seeing color is to be well dark adapted. I rarely turn on a light at night when imaging the night sky. I usually work only by star light, except for the LCD light on the camera (which blows away my night vision for several minutes). I see many photographers using bright red lights. That destroys night vision and warps color perception. If you've been exposed to red light and you then look at something dark, it appears blue. See my article on protecting your night vision and lights for more details. Figure 12. 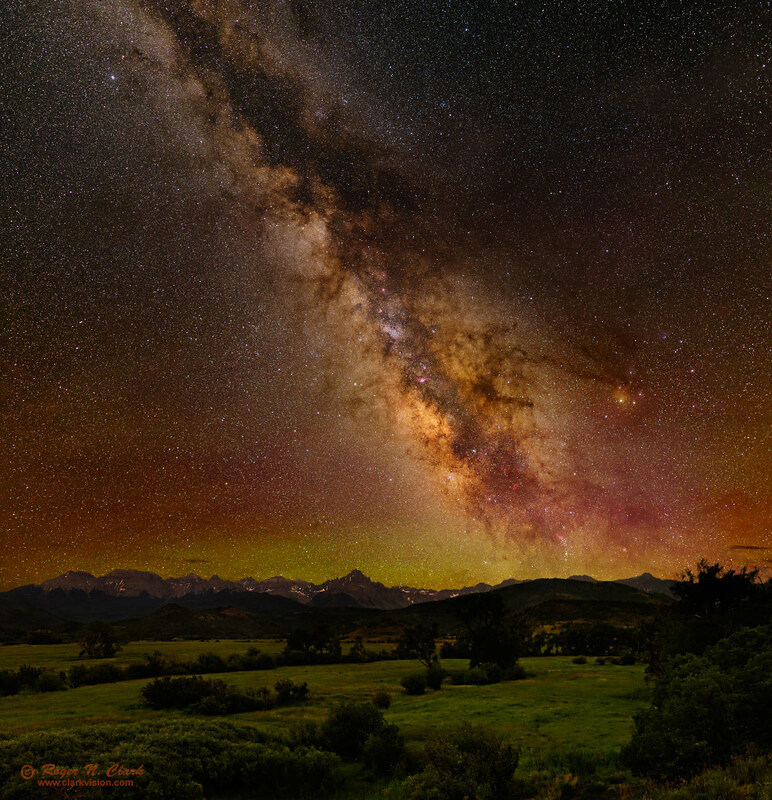 Summer Milky Way Nightscape with the San Juan Mountains of Colorado in natural color. Figure 13. 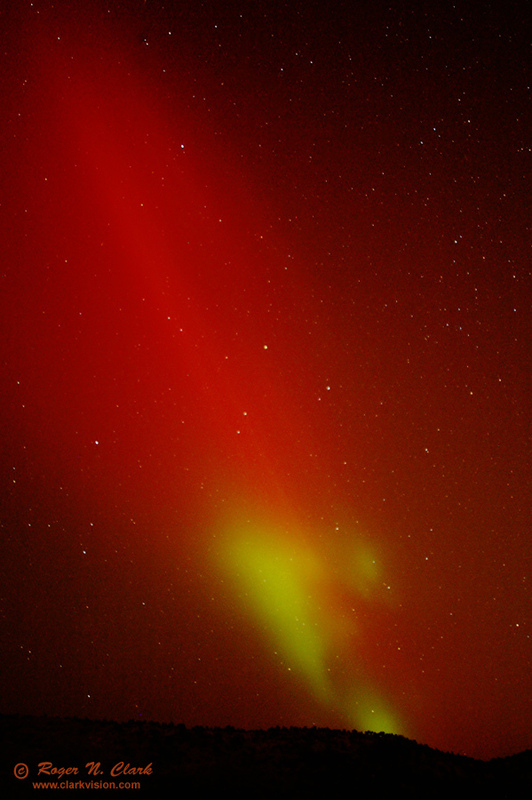 Pink aurora in natural color in the north on the same night as the image in Figure 9 was obtained. The yellow color on the horizon is light from the city of Montrose, Colorado. Visually, the city light looked yellow and the aurora looked pink. A daylight white balance on the digital camera produced colors consistent with the visual record, while a tungsten white balance did not. 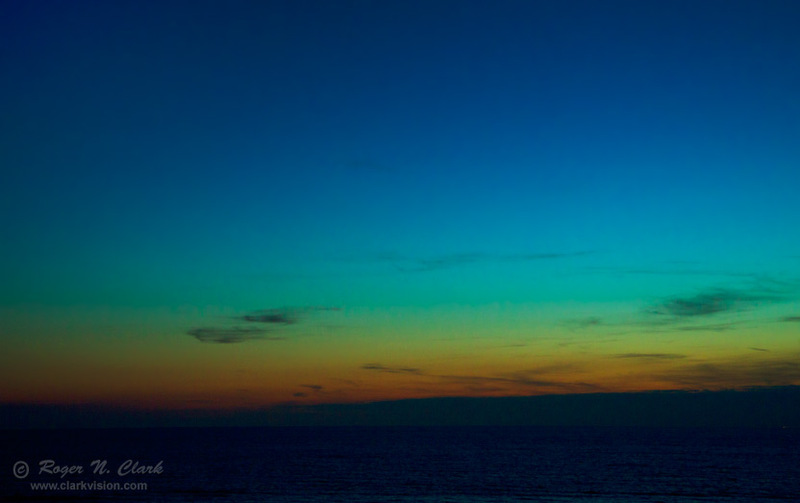 Why color the night sky blue? People go the polar regions and image aurora but don't change the colors to blue. These same emissions from oxygen (mostly) and other molecules/ions (e.g. hydroxyl) in the upper atmosphere occur all over the world at some level, so I just do not understand the idea of warping the color to blue. To me this is like saying the sky is blue, so when one images a red sunset, change all the colors to blue. In the night sky, I find the bands of green, red, yellow and orange to be interesting formations making each night image unique, much like cloud formations in the daytime, or much like a sunset is unique. I have observed what is called banded airglow for decades, but before the digital era with film, I just thought that the light was from cirrus clouds and stopped imaging. With film, the exposure times were so long, that the movement of the airglow bands smeared out so much that they weren't recorded. Now with a quick few second DSLR exposure then examining the result on the LCD shows the true nature and beauty of this phenomenon. Also see my night images gallery: http://www.clarkvision.com/galleries/gallery.night/. Also see Nightscape Photography with Digital Cameras for how to make stunning nightscape images. The wavelengths of airglow emission lines, while like those from fluorescent lights, is by different atoms. Fluorescent lights typically use neon or mercury. Thus, the wavelengths of emission are different and the color balance would be different. It is technically incorrect to use a digital camera fluorescent white balance for imaging the night sky. Imaging the night sky shows amazing colors caused by a wide range of natural processes. The night sky is not black, and is rarely blue when the Moon is not out. When the Moon is out and bright enough to color the sky blue (through Rayleigh scattered moonlight) stars and the beauty of the Milky Way galaxy are largely lost. 4) Digital Cameras: Does Pixel Size Matter?